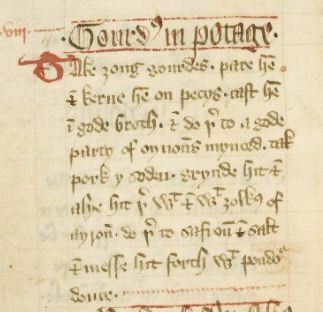 A Forme of Cury is a handwritten cookbook from the Royal household of Richard II of England. It contains 194 recipes that were used in the royal kitchens in the late 14th century. It was written by the chef master of cooks under the careful eye of the King's masters of Physic (physicians) and Philosophy. At the court of Richard II, food not only had to please the eye and palette, and nourish the body, it also had to balance the humors to prevent illness. The cooks also had to observe the dictates of the Church with regards to which foods could be eaten on which days. During Lent, they couldn't serve any land animal or the products of land animals like butter, milk, cheese. Even birds and eggs were prohibited. But fish, mollusks, and crustaceans were allowed. So the king's chef master of cooks recorded recipes for meat days and fish days and gave variations for most recipes. The recipes in Forme of Cury are not written with precise measurements like they are in modern cookbooks. They were more like "aids to memory" giving only the basic ingredients and short instructions on how they were combined. Many ingredients that we take for granted, like baking soda, didn't exist yet and others like pepper were in short supply. On the other hand they had spices like Pellydore made from the dried roots of Pellitory that we don't have. The language, spelling, and letterforms are ancient, but still readable. Recreating the recipes offers a valuable way of understanding life in the Middle Ages. A page from the manuscript showing "Gourds in Potage". Here are two recreations of recipes from A Forme of Cury plus another I created in the same style to complement the meal. Powder Douce—Pumpkin Pie spice or a mixture of cinnamon, cloves, mace, ginger, pepper, and sugar. Bake the squash in the oven at 350° until it is soft, about 45 minutes or mcrowave it on high for 15 minutes. Cool it until it is easy to handle. Cut the squash in half and remove the seeds and dark colored pulp. Score the flesh horizontally at 1-inch intervals. Scrape the flesh into a bowl, it should come out in short strands. In a large cast iron skillet, fry the bacon and add the minced onions. Sauté until the onions are a little translucent. Add all the squash strands and raisins. Mix it all together then smooth the surface and allow it to cook until brown on the bottom. Meanwhile mix the egg yolks with the broth and saffron, then let it sit for a few minutes to bloom the color. Mix the color into the pottage and season with salt and Powder Douce. Cook for a few more minutes. Serve or store in the refrigerator. The flavor gets sweeter overnight, making this a good make-ahead dish. Just heat and serve. Makes 8 servings. A bruette is a broth thickened with breadcrumbs, egg yokes, nuts, or a combination. For this recipe I toasted 4 slices of whole wheat bread at 300° in the oven until crisp all the way through, but not burned. Then I broke them in pieces and ground them in a coffee grinder that I use for spices and bread crumbs. You can also use a morter and pestle, a blender, or food processor. 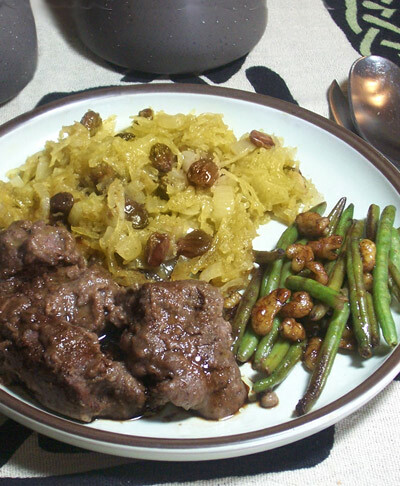 There are many similar medieval recipes for beef, pork, mutton, and poultry. My tasters liked this dish best with chicken breasts, saying it was good with beef but the chicken was more delicate. The original venison recipe ("Roo Broth" from A Forme of Cury) includes blood used to thicken the broth and to add color. Since blood is difficult to obtain now, I have chosen to brown the meat in a sofrito of salt pork, sugar, and anchovy paste instead. You can substitute 1 ounce of tomato paste for the sugar and anchovy paste if you prefer. Take the line (lean, loin?) of the deer (male) or of the roe (female). Parboil it in small pieces. Seeth it well half in water and half in wine. Take bread and bray it with the self broth and drawe blode there to and let it seeth together with pouder forte of ginger and of canell (cinnamon), and mace, with a great portion of vinegar with Corinthian raisins --Form of Cury XIIII 1390 A.D.
1-½ lbs of lean venison, chicken breast, beef, mutton, or pork. 1-½ cups of sweet red wine (Chianti), port, or sherry. 4 slices of toasted whole wheat bread, ground to crumbs. ¼ cup of red wine vinegar (more if necessary). Powder Forte—a mixture of ground ginger, cinnamon, mace, and pepper. Variations: For an even richer flavor, replace half of the breadcrumbs with ground toasted walnuts or almonds. Since I wanted to put raisins in the squash, I left them out of this dish. But dried fruits of all kinds were commonly added to meat dishes like this, so you can vary this dish by adding dried raisins, prunes, apples, apricots, cherries, or blueberries. Makes 6 servings. Images of the entire book, A Form of Cury from the John Rylands University Image Collection. Take note that when you open each page, a transcription of the page can be found in the left hand column. If you want to add this article to your list of favorites or email it to a friend, please use this permanent URL, http:/stores.renstore.com/-strse-template/1207B/Page.bok. Permission is granted by the author to quote from this page or use it in handouts as long as you include a link back to Renstore.com.